My heart sank when my husband, Al, told me that the Lord was impressing on him to return to Telegraph Creek. Although I loved the people, I had little desire to take our children back to the isolated bush of northern British Columbia. It would mean boarding school for the children, living without electricity and phones, no mail for weeks at a time, and very little health care services. Soon another couple moved near us to start a Bible camp. They invited us to have a weekly Bible study with them. Long winter nights were perfect for reading the Bible, and the light of Scripture brought understanding. We submitted to Christ as Lord and found the true refuge, not in the mountains, but in Jesus! 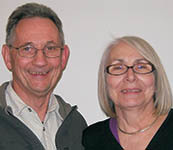 To find answers to our growing desire to know Christ and make Him known, we moved to Three Hills, Alberta, to attend Prairie Bible College, and Al graduated in 1978. Now, a letter had come from this couple asking us to help them make disciples among the Tahltan people. “If God wants us to go back, He will have to speak to me, as well,” I thought as I prepared for church and looked forward to a morning of worship, teaching and fellowship. The morning sermon was about Esther, a woman with whom I would never had thought to compare myself. Yet God began to show me that I, like Esther, had been chosen to come into God’s Kingdom. In the summer of 1978 we returned to Telegraph Creek with our six children to share the Good News. After the death of our daughter, Amanda, in 1990, we moved to Fort St. John (BC) so the children would not have to return to boarding school. We served at the Halfway River First Nation and the local Bread of Life Soup Kitchen until 1998, when Al was appointed NCEM Western-Field Director for two terms (which included travel to ministry points far north and south of Ft. St. John). Today Sunrise Radio, continued ministry at Halfway River Reserve, and right in Fort St. John is our focus and passion, as we continue to follow the Lord. (from Issue #531) Note: some of the locations and involvements of our missionaries may have changed since the original publishing of this article.